For all of the 21st century, the New England Patriots have been a dominant force in the NFL. Since Coach Bill Belichick and quarterback Tom Brady first joined forces in 2001, the duo has seen 12 playoff appearances, 12 AFC East championships, 6 conference championships, and now, in their thirteenth year together, they are gunning for their fourth Super Bowl. Belichick and Brady are among the best ever at their jobs, and together there might be no one better. Or is there? Also, it is worth noting that these points add. So a team that makes it to the Super Bowl would get four points for making the playoffs, plus six if they won their division, plus 10 for winning their conference, and then an additional 20 for winning the Super Bowl for a potential total of 40 points. Also, just as the NFL record book does not include statistics for players who played in the All-American Football Conference before merging with the NFL, I will not include the success of coach-QB tandems in the AAFC. Believe it or not, this actually has a significant impact on one pair. Having said all that, here is the top 10 most accomplished coach-QB combos in NFL history. Brady and Belichick top that list, even if they don’t win the Super Bowl this year. Their 12 division championships are twice as many as any other pair in history, and their six conference championships are tied for first with two others. Should they win this Super Bowl, they will become the only coach-QB combo to win that many. Of course, they’ve had many years together to accomplish that — 13 to be precise, the longest run by any coach-QB tandem. On the other hand, Vince Lombardi and Bart Starr, who won three world championships and two Super Bowls, did so in only nine years. Likewise, the combos of Paul Brown and Otto Graham, Bill Walsh and Joe Montana, and Tom Landry and Roger Staubach all put up strong numbers in significantly fewer years than Belichick and Brady. Brown and Graham are particularly fascinating, as they appeared in the championship game all six years that they were together, winning three. Before they joined the NFL, they were together in the AAFC for four years and won its championship every single year. As I mentioned before, we are not counting success in the AAFC, although if we did this tandem would be the only one to be greatly affected by it, and would no doubt move up at least a few spots. And finally, just making the top ten are Tony Dungy and Peyton Manning, along with Mike Holmgren and Brett Favre. These two pairs had remarkably similar success – they only had seven seasons together, made the playoffs nearly every season, and each quarterback came away with three MVPs, but they only came away with one ring each. Meanwhile, facing off against the Patriots are the Seattle Seahawks, led by Coach Pete Carroll and quarterback Russell Wilson. In only three years, this is their second Super Bowl appearance, and a win would propel them to near the top of the most accomplished coach-QB active pairs. First among all active pairs is (obviously) Belichick and Brady, but then after that there is a steep drop off. Tom Coughlin and Eli Manning are in second with 98 points, most of those points due to their two Super Bowl runs. After that, though, it’s a two-way tie at 84 points (for now) between Green Bay’s McCarthy and Rodgers and Pittsburgh’s Tomlin and Roethlisberger. Should Aaron Rodgers win the MVP award, as most are projecting him to do, the McCarthy/Rodgers tandem would jump ahead. Also, a win in the Super Bowl would bring Carroll/Wilson up 84 points – tied with these two teams. Should that happen, they would jump past Sean Payton and Drew Brees, as well as John Harbaugh and Joe Flacco, who have 68 and 66 points respectively. So in conclusion, as you watch the Super Bowl this Sunday, take a moment to appreciate everything Belichick and Brady have done, as you will be watching living legends: the most accomplished coach-QB combo in NFL history. That’s an over-simplification for sure, but I doubt many would argue with the outcome of the top spot. 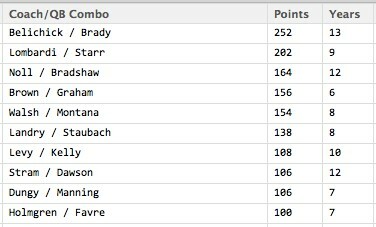 Belichick/Brady should be at the top regardless of how you calculate the standings, however, I think you’ll find a lot of arguments (many of which are subjective) in the order of the 9 pairs ranked below them.